EA Sports’ FIFA 10 sold an accumulative 10 million units making it the best and fastest selling sports games of all time. The next football title from EA comes in the form of 2010 FIFA World Cup and it comes to no surprise that it has shot its way into the UK charts. 2010 FIFA World Cup has taken top spot in the latest UK charts. 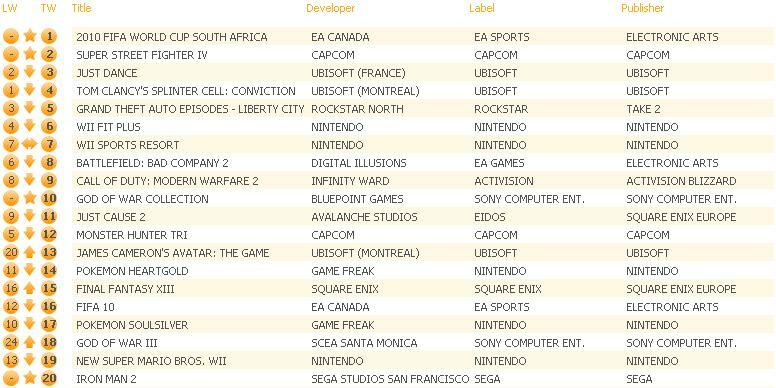 Another debut in the UK charts is Capcom’s Super Street Fighter IV while the recently released European version of God of War Collection occupies 10th position. Be sure to read PlayStation LifeStyle’s 2010 FIFA World Cup review, if you haven’t already.